Familiarize patients with your treatment philosophy and Chiropractic specialties. Reactivate dormant patients utilizing targeted promotions. Foster trust and understanding of Chiropractic methods. Capture patient contact and email information with downloadable EBooks. Create segmented patient email campaigns. 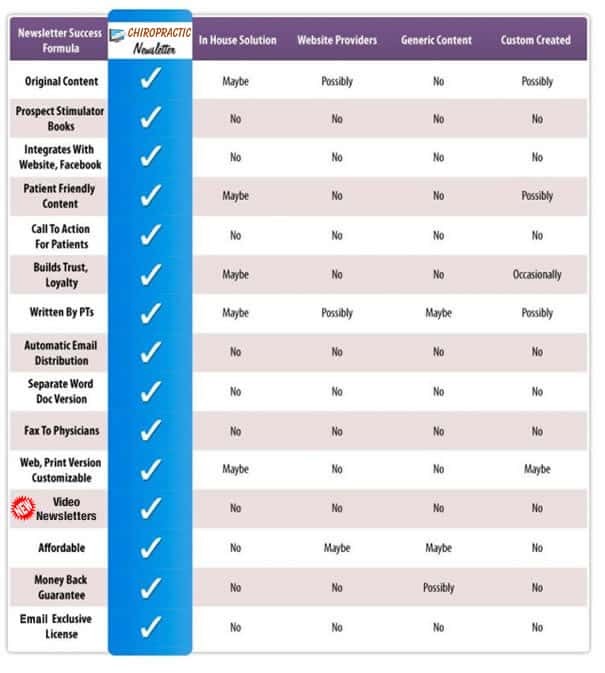 Complete control over your customized newsletter: how often, content message, and means of delivery. See For Yourself Everything Chiropractic Newsletter TMCan Do For Your Clinic! Marketing Your Clinic Doesn’t Get Any Easier Than This With Our Done-For-You System. The content is created by professional writers bi-weekly. Every two weeks, the newsletter’s content is updated / fresh. After you have customized your clinic’s contact info and logo, it will remain the same unless you decide to change it at a later date. You may also edit the content portion to better reflect your chiropractic niche and treatment methods. This new newsletter is emailed automatically to your patient list bi-weekly. The entire process starts again. Broadcast To Your Patients On-Demand. Ideal for when you wish to make a special announcement, or to highlight a special promotion; Chiropractic Newsletter’ssophisticated email broadcast system lets you communicate with patients quickly and easily. No advanced web skills needed; if you know your way around Microsoft Word, you can create and send messages…whenever you wish – as many times as you want. NEW! Personalized emails sent to any patient using Chiropractic Newsletter’s personalization fields, that make patients feel special and nurture loyalty to your clinic. Reflect Your Clinic’s Unique Image. Personalize your newsletter’s look and style using Chiropractic Newsletter’s state-of-the-art editor. Headers, footers, colors and additional aesthetic options are all fully customizable. Your newsletters are written with one goal in mind…the growth and success of your clinic. Our staff of dedicated professional writers exhaustively research and create every article line-by-line, which appears in your newsletter. Along with this careful attention to detail; YOU have complete creative control that allows you to add, remove, or edit content to reflect your personal treatment style, clinic identity, and chiropractic niche. Email Yourself Five Past Therapy Newsletter Issues And Decide For Yourself. Make passive visitors to your website active subscribers and potential patients with done-for-you EBooks devised to motivate visitors to leave their name and email addresses. Build your newsletter’s email mailings list quickly, while introducing your clinic and engaging new prospective patients with easy-to-use forms provided by Chiropractic Newsletter. 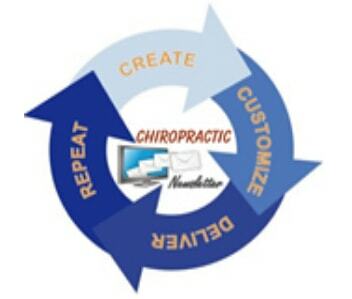 Chiropractic Newsletter’s Sophisticated Internal Referral System Builds Your Patient List Fast. Increase the size of your patient list with Chiropractic Newsletter’s viral marketing component “refer a friend”. Every time a present happy and satisfied subscriber / patient ‘refers’ your clinic’s newsletter to family, friends, or a co-worker by using an embedded form, this referral is automatically added to your newsletter’s subscription base. The referral will start to receive your newsletter bi-weekly, and your patient list will grow quickly and easily. Your clinic will also have the contact details needed to offer and schedule a consultation. Spotlight your chiropractic methods and showcase your clinic to the community by accessing previous issues of Chiropractic Newsletter and having them available to visitors on your website. Highlight past issues from the archive to enhance your clinic’s perceived expertise and build trust with visitors. Edit customize previous newsletters which can be sent out also. Chiropractic Newsletter’s plug-in and use technology for your website allows you to import your current patient lists and emails. Gather visitor contact information and email addresses easily. View, edit, or export your entire database with our simple “click-it” system. Evaluate your open rates, track broadcast dates, and make sure your list is ‘clean’; apply our exclusive hard bounce email-removal technology to automatically delete invalid or mistyped email addresses, ensuring a high delivery rate for your newsletter. We don’t allow your subscribers to receive newsletter from our system, which gives you the ability to exclusively market to your patients. This unique feature is called ‘Email Exclusivity.’ When a person of interest enters their info into your newsletter system, they can’t be added to another Chiropractic Newsletter account with the same email address. It’s easy with a beautiful, completely customizable copy of Chiropractic Newsletter, from a Word document providing you with the flexibility to rapidly customize and print high-quality color or black and white newsletters that can be handed out to your patients and local businesses.